I have always wondered how you know the number of grafts they are telling you that they have transferred is the true/correct number. You just have to trust your hair restoration surgeon? I especially became suspicious since I just recently went for two different consults on the same day (it was with the doctors themselves in their offices). One of the surgeons said that he could probably get 3000-4000 grafts from my donor area (I already had a surgery using 4200 a year ago). The second one said the he didn’t see it being possible to get more than 2000 grafts and that was the maximum. He said it was impossible mathematically to reach anywhere close to 3000-4000. 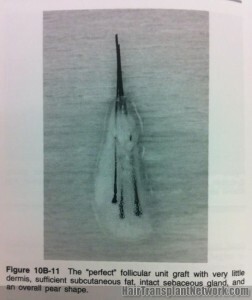 As a hair transplant patient, it’s important to know what to look for when viewing your very own follicular unit grafts. 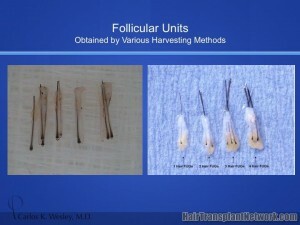 There’s a big difference between “healthy” versus “denuded grafts”. 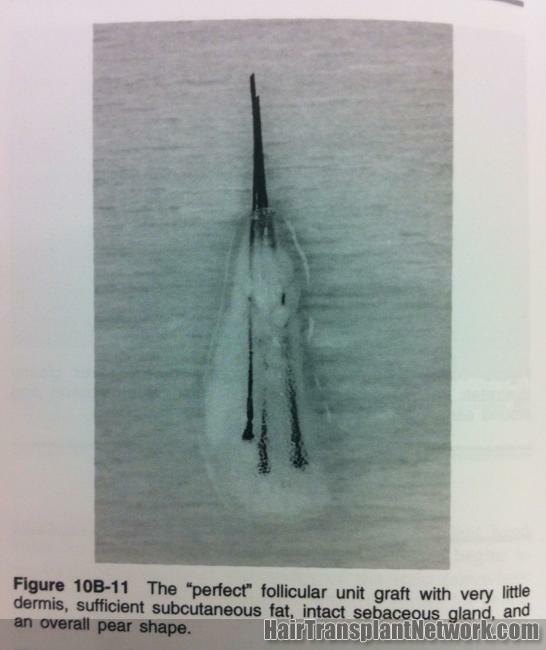 Ideally, each graft should possess a healthy amount of subcutaneous and dermal tissue that protects the stem cell-containing portions of the follicle: the bulb and bulge, respectively (as seen on the right side of the first image as well as the second image below). 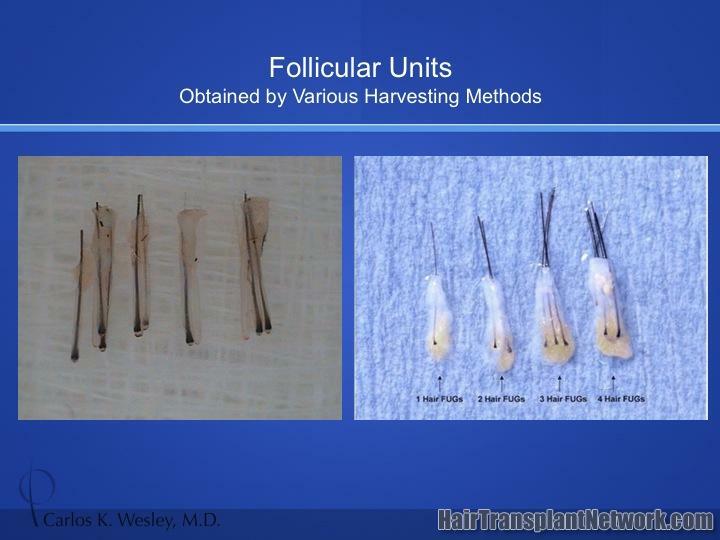 Denuded grafts do not have that tissue and are more susceptible to dehydration and traumatic handling (both of these hazards decrease hair survival when transplanted). Another way to be gain more confidence in the actual number of grafts may be to be charged a flat fee rather than being charged by the graft. This way, there is really no incentive to “fudge” on the numbers or to take a naturally-occurring 3 or 4-hair graft and split it into 3 or 4 single-haired grafts (that, as a result, do not possess much protective tissue around them). Finally, in addition to being able to see the grafts, as a patient, you should also be free to view the physician as he/she is making the recipient sites. This is really where the artistry comes into play and the time and attention the physician is taking to follow the exact angle and direction of the pre-existing hair is critical for natural-appearing results. 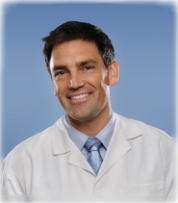 Arachidonic Acid: Useful Hair Restoration Treatment or Hair Loss Culprit? Did Hair Transplant Surgery Change the Position of My Ears?